Fully-furnished one to four-bedroom apartments with private balconies providing panoramic views of the stunning surroundings. 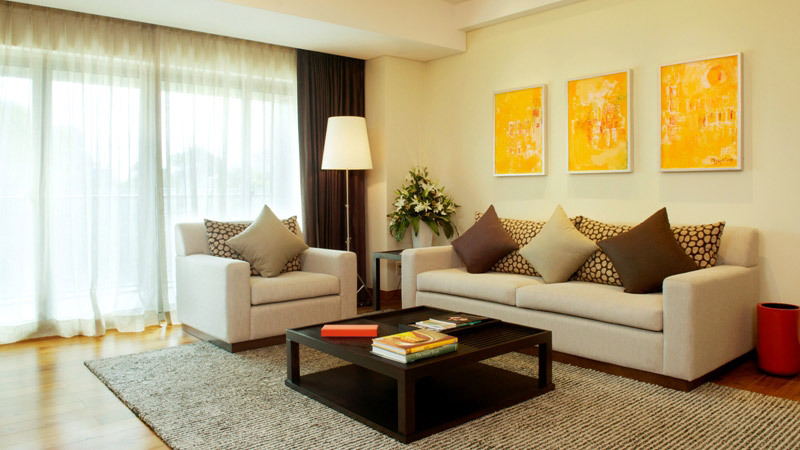 Each space features plush interiors, modern amenities and elegant furnishings, creating a luxurious harmony of comfort and sensorial tranquillity. Facilities include saltwater swimming pool, gymnasium, golf chipping range, tennis courts, barbecue area, playground, promenade, supermarket and shuttle bus. While InterContinental Saigon is notorious for the free-flowing champagne at Market 39’s Sunday brunch and, of course, best known as a hotel of the highest international standards, there’s much more to it than that. InterContinental Residences Saigon has been honoured as Vietnam’s Leading Hotel Residences 2017 by the prestigious World Travel Awards, offers residents some of the most exquisite and contemporary apartment spaces in Ho Chi Minh City, at a prime location in the heart of the major business and cultural area, District 1. The 31-floor residential tower is part of M Plaza Saigon building, one of the city’s top integrated complexes housing renowned stores, restaurants, bars, the InterContinental hotel and its residences. What InterContinental Residences Saigon is most proud of is the exclusive “Live, Work, Entertain” lifestyle concept that they offer to their high-class tenants. This is a place to settle, a place to inspire and a place to enjoy life all at the same time. The generous, fully-furnished apartments come in different sizes, ranging from 78 m2 to 204 m2, and it’s all your choice. There are 260 residences in three configurations – one, two and three-bedroom apartments – and they boast a variety of layouts, with the larger three-bedroom residences located on top, from the 23rd to 31st floors. As one would imagine, this creates stunning panoramic views of the city. The uncluttered and open-plan design with neutral tones that InterContinental Residences Saigon displays creates a warm, chic and welcoming environment for residents. These 5-star surroundings attract all kinds of tenants, such as families, business travellers and local expats. The Residences are located right in the city centre, only minutes away from famous landmarks like the Notre Dame Cathedral, Ho Chi Minh City’s Central Post Office, the Reunification Palace and the City Hall. This gives you all the options to enjoy the city’s unique culinary and nightlife options. Restaurants, coffee shops, bars and clubs are all just a hop away. But InterContinental Residences Saigon gives you the choice: rather than taking advantage of the premier location, you might wish for a selection of deluxe in-house facilities and venues. And why leave if the best is right here? Let’s start with the apartments. The exclusive amenities of the InterContinental Residences include a private balcony, a dining room, a living room, modern bathrooms, the latest audio-visual equipment, broadband internet connection, a fully equipped kitchen (stove, microwave, washer/dryer, etc.) and multiple individually controlled air conditioning units. Why go to movies if your in-home theatre is always open for a private show? Or how about going out and staying in at the same time? We’ve talked about Market 39, where regular buffets will make sure you indulge in a broad range of appetising dishes. YuChu Chinese Restaurant spoils you with a whole different cuisine: dim sum and Peking duck make for a palatable Far Eastern eating experience, and one of the finest in town. Residents can also enjoy a wide range of additional facilities that enhance their quality of life at InterContinental Residences Saigon, such as a 24-hour health and fitness centre with steam room and sauna, a spa, a deluxe residents’ lounge, a playroom for the kids and a fully-furnished boardroom for family gatherings. 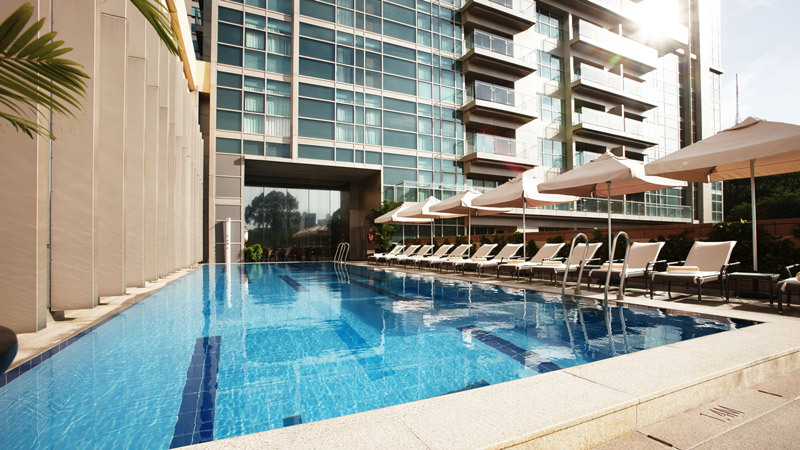 The large outdoor swimming pool is located on the third floor and comes with a designated kids area. The business centre on the second floor provides residents with a sleek working space out of the privacy of their home. 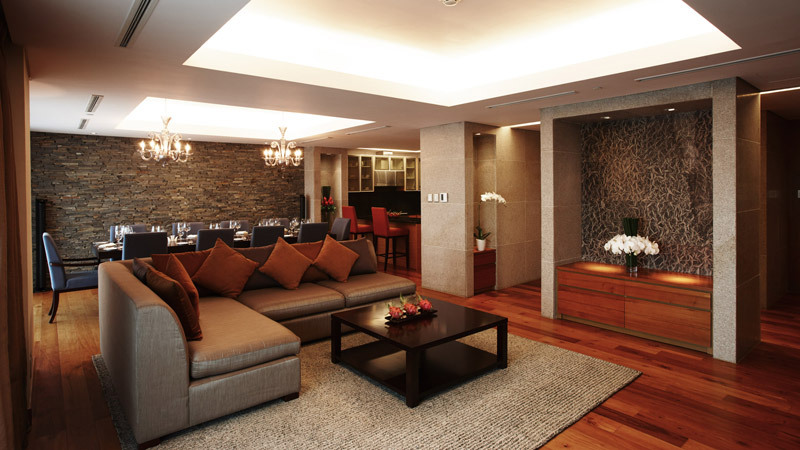 In order to maintain the world-class services, the residence facilities are frequently renovated. One can tell that InterCon strives to make this a place ideal for people enjoying every sort of lifestyle. InterContinental is unarguably one of the key players in the hospitality sector worldwide. 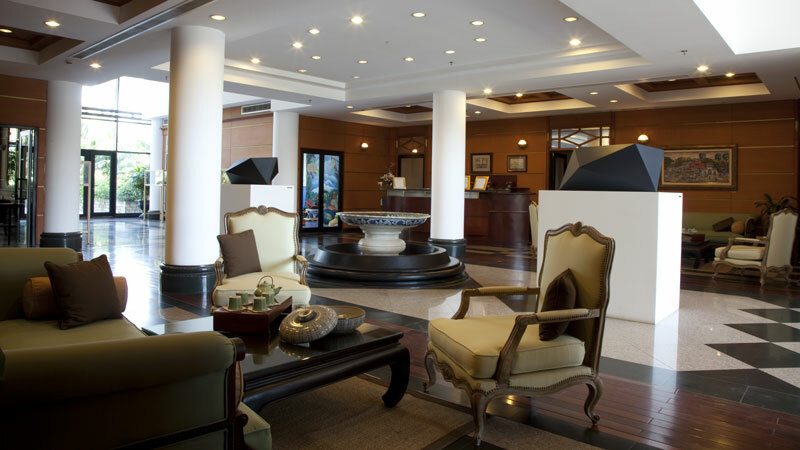 Tenants at InterContinental Residences Saigon benefit greatly from the high standards of the hotel, as they are spoiled with the exceptional services of a prestigious international luxury brand. The hotel standards are all covered: Laundry and dry-cleaning service? Yep. Parking service? Sure. Apartment service? Any time. Tour service? Of course. Airport transfer? You know the answer. The high-class service team is available 24/7, an amenity not many living spaces can offer. Safety standards are as high as it gets. InterContinental Residences Saigon has its own security department working 24 hours, as well as the latest fire and life safety systems. Many guests use the luxury apartments for a short-term stay and most point out the exceptional facilities of the residences and the high quality of life at the spacious apartment options. The occasional non-excellent review mentions a lower standard of service at the residences compared to the hotel, but there’s a clear agreement about the extremely comfortable beds. The bottom line is: All that glitters is not 5-star. 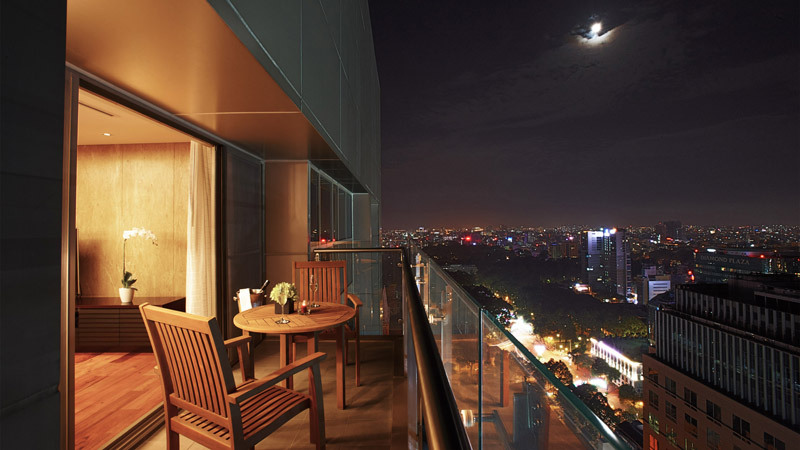 InterContinental Residences Saigon is, broadening world-class hospitality standards to a deluxe living space. Local insight: Confirmed long-stay apartments (6+ months) come with a list of rewards to choose from: Exclusive spa treatments at Spa InterContinental; Dinner buffet at Market 39 Restaurant; Weekend stay in InterContinental hotels within Vietnam and Cambodia. Located about eight kilometers from District 1, and right by Binh Thanh, Thanh Da Island is Ho Chi Minh City’s rural enclave. A peaceful, lush area made up of great local eateries, dingy homes and some farmland, this island’s first (and currently only) introduction to the luxury residence scene was the opening Saigon Domaine Luxury Residences in 2001. The timing was right - the residence was the first of its kind in the city, blending Vietnam’s tropical flora with contemporary apartments in a way that respected the surroundings and brought foreign guests closer to Vietnamese culture than city residences could ever do. Foreign communities are springing up everywhere in the city (Koreans in Phu My Hung, the Japanese area in District 1, the Westerners spread through Thao Dien in District 2), but Saigon Domaine remains the only luxury Western-style residence on the island, making it a standout sight. The hotel has won numerous accolades, including three straight years of awards from World Luxury Hotel Awards and several years as TripAdvisor Travellers’ Choice winner, as well as being the recipient of TripAdvisor’s Certificate of Excellence for the past few years. 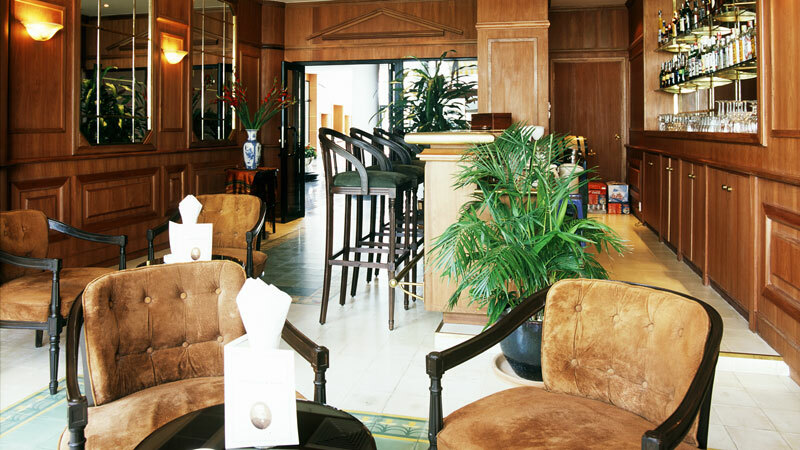 Saigon Domaine keeps a long-term staff that has served the residence well over its years. Everyone is friendly and accommodating, although there is not an abundance of employees milling about - the space is kept friendly and personal with a dedicated team, which can sometimes make the residence look empty. Reception staff speak English, so it’s never an inconvenience to ask for something. A shuttle bus and speed boat to the city center are provided for guest convenience. The rooms are Saigon Domaine’s bread and butter. They are in word, excellent. You know you’re in for something nice when you see each room individually named after a classic boat rather than a room number (although it sometimes makes finding your room a bit confusing). Immaculately clean, expertly arranged and decorated, offering sweeping views (especially on the upper floors), the rooms in Saigon Domaine are spacious, fully equipped and a joy to stay in. 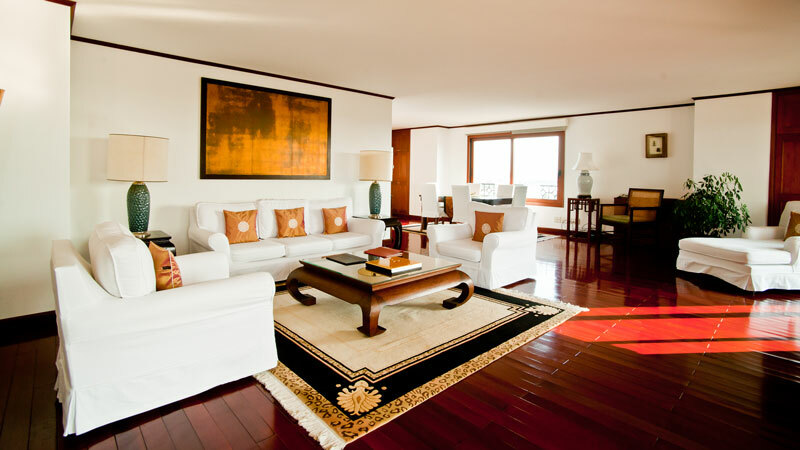 Being a residence rather than a hotel, Saigon Domaine is, naturally, better equipped. The 45 suites all have kitchens, wooden floors, balconies, fridges, washing machines and basic utensils and cutlery. Whether you’re in the cozy (but still large) one bedroom rooms or in one of the two garden-equipped, massive four bedroom units, you get the same amenities. Sizes vary, but for the most part every room has more than enough space (three bedroom units are a staggering 196 square meters). The two four bedroom units are massive, with full outdoor areas stacked with trees and plants and sunning areas. A party of up to seven may stay in these rooms. These generous luxury apartments are just as suitable for living as staying for a single night. In fact, there have been recent residents that have stayed for up to four years. 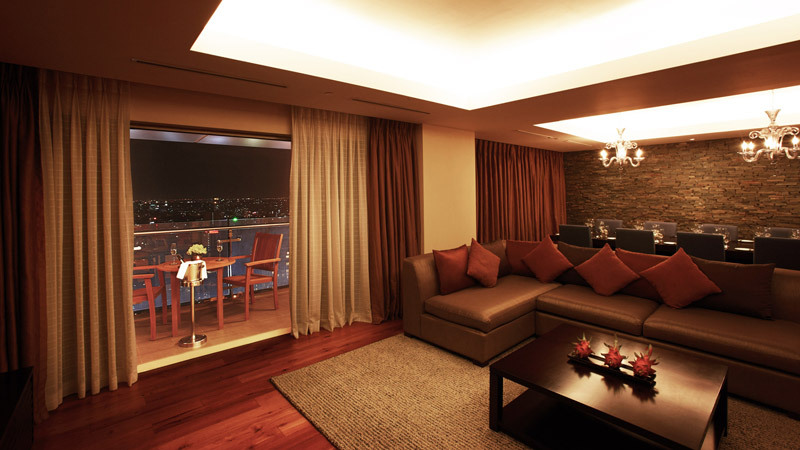 A view from the upper floor rooms offers a dominantly green vantage point, from which to enjoy the view of Thanh Da. The island is one of the few vestiges of the classic, tropical Vietnam still close to the city center. The nighttime views are captivating, after which you get a wonderful sleep on their soft, spacious beds. There is no dedicated restaurant space (the nearby local places make up for this), but there is a bar inside the building and by the pool. Saigon Domaine is more of a quiet retreat than a place to unwind, so don’t expect the best-mixed cocktails. There is, however, a decent selection of spirits, including some Japanese Whiskies. Since you have a fully equipped kitchen in your room, the option of cooking something from the store a few minutes down the block is not as far fetched as one may think. The in-room menu has some classic sandwiches and soups available, but if you’re not opposed to trying the local restaurants minutes away by foot, then the staff can tell you some of their favorite recommendations. Breakfast is included and is tasty, consisting of a Western buffet served right by the river. 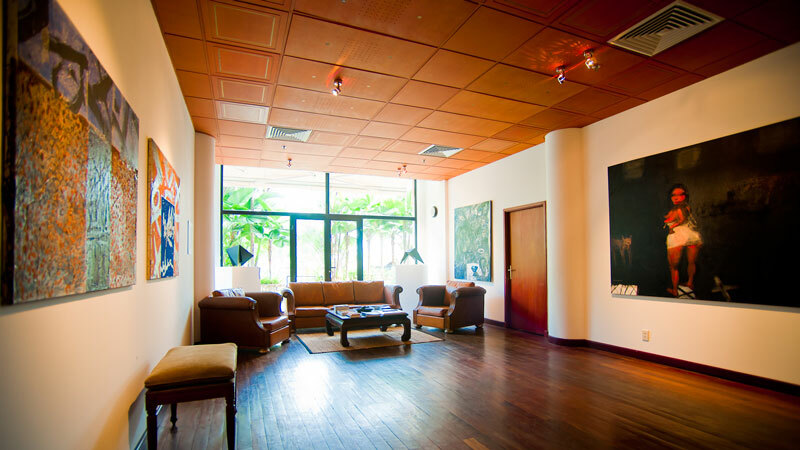 It may surprise most, especially since Saigon Domaine is in the middle of an island in Vietnam, but the best way to summarize the facilities here is to imagine a mix between a modern apartment building and a contemporary art museum. One of the general manager’s true passions is collecting modern art. And we don’t mean a few abstract paintings in the lobby. There are several large exhibition spaces that showcase displays, which can range from strangely arranged objects to elaborate clothing to an entire recreated room. Even the free-to-use meeting area, fitted with old, expensive furniture and computers, has a number of paintings and an item on display. This creates a dreamy, surreal space in the middle of “rural” Saigon. On the lobby floor, you will find a gym, steam room, sauna, showers and bathrooms, along with a bar and convenience store. Everything is neatly laid out and easy to find. Just outside the building is an excellent outdoor space, fitted with a children’s pool, garden, play area, adult pool (available for free for all guests, and $15 US per day for outside guests), a breakfast and meeting space, and additional space for meetings, company outings and family gatherings. 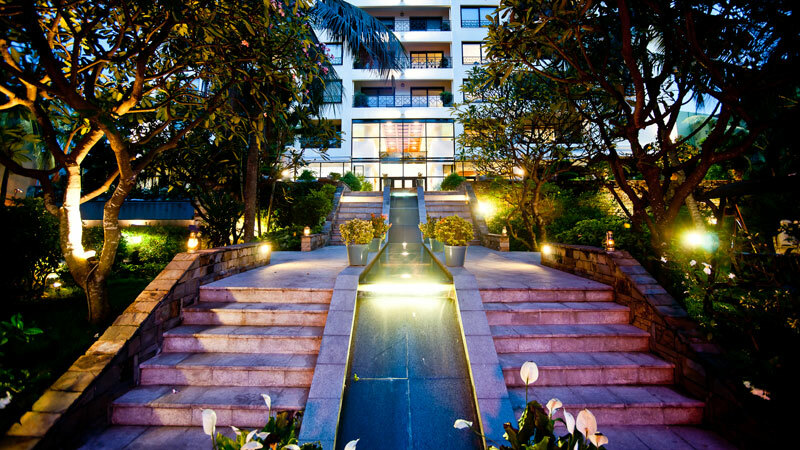 The area behind the building is great for company and family events, with the peaceful Saigon River to one side, a beautiful garden area in the middle and the luxury residence on the other side. – While the spirit selection is fine (including some nice Japanese Whiskies), the bartending at Saigon Domaine is not up to 5 star standards. – While unique, the lack of numbers on rooms (which instead use names of famous boats) can confuse some guests. With over 200 reviews and a 4.5 overall rating, Saigon Domaine has a solid reputation on TripAdvisor. Many compliment the excellent service and beautiful rooms, with some minor complaints about the location. Despite this, some prefer the distance from the city center as it affords peace. Many enjoy the breakfast by the river.